Do you work with people sleeping rough? Many homeless patients seen by Pathway teams face mental health problems. Pathway supported the opening of the UK’s first homelessness service within an inpatient mental health unit and teams liaise with partners in mental health services and include mental health professionals in team. However, many outreach workers face problems when supporting people who have mental health problems who are sleeping rough. This mental health and homelessness guidance is designed to address this. 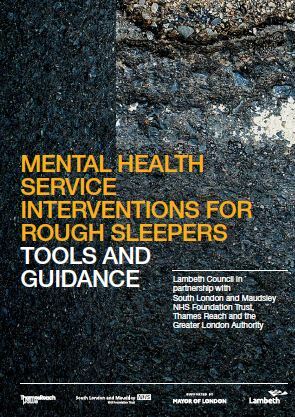 Pathway works with The Greater London Authority, Lambeth Council, South London and the Maudsley NHS Foundation Trust and Thames Reach to publish tools and guidance to help outreach workers supporting people sleeping rough. The publication includes practical tools guiding workers through the use of the Mental Capacity Act and Mental Health Act. It has been regularly updated to include statutory changes, the most recent update was published in autumn 2017. The tools and guidance are for everyone who works with clients or patients on the streets. The Faculty for Homeless and Inclusion Health endorsed this work to help us all respond to the needs of vulnerable people on the street. The Mayor’s office and Pathway are funding free seminars for specialist staff in London to help implement the guidance. Sessions can also be commissioned in other areas. Please contact us to arrange training in your area. Support workers from housing and mental health services in London with expert advice. Give guidance to workers in the homeless sector around considering whether someone has mental capacity to make a particular decision. Help health workers understand how services for homeless people operate. All messages will be answered within 24 hours by an Approved Mental Health Professional with experience of homelessness and mental health. The service is open to any professional or organisation working with people sleeping rough, or who have had a homeless person sleeping rough referred to them. Please remember to leave contact details, and a brief outline of the issue.